Learn more about how perennials get established and grow in the garden. Perennials are often beloved by gardeners for the beauty they add to gardens year after year. However, while annuals look their best within weeks of planting (they'd better, they are gone at the end of one season) perennials often take time to come into their full glory. While not all perennials need time to look and do their best, this is a common enough phenomenon that there is an actual adage for it "The first year they sleep, the second year they creep and the third year they leap!" But what does that really mean? Spring has finally sprung and the gardening itch just has to be scratched, so you head to your local garden centers and haul home botanic treasure. You plant them in their new homes and wait with great anticipation for floral glory, only nothing happens. The plant just sits there, taunting you, seemingly content to laze the summer away without growing much bigger. Now if you had a thinga-ma-jigger (I have a three year old daughter, PBS kids may literally have saved my sanity) you could hop aboard and take a look and see that while it's true that nothing much is happening above ground, there is a lot happening underground. Roots are what's happening. Some perennials spend most of their energy the first year creating a great root system, instead of growing a lot on top, and that is the basis for great plants in the long run. Well-developed roots are better at finding and taking up both water and nutrients, not to mention anchoring the plant in place and keeping the plant healthy which translates into better pest and disease resistance too. Does this mean that if you planted a perennial and it took off right away and put on a show the first year, it is doomed to live a short life? Absolutely not! It simply means that the plant was better at multi-tasking and managed to grow strong roots and tops the same year. The picture above is of Decadence® 'Lemon Meringue' Baptisia, a classic example of a plant that sleeps, creeps and then leaps. I found great plants with multiple stems and an extensive root system last year at my local garden center, but they were mostly in a holding pattern their first season. Now that they are going into their second summer in my garden, I'm seeing more flowers and stems, but I am expecting them to do something even more spectacular next year. In fact, I am on the hunt for four more plants to make this grouping even more awesome. In a perennial's second year, even though you can't see them, the roots are growing bigger and stronger. You'll notice that there is more foliage and flowers than the first year. That's important because the leaves are the "engine" for the plant -- they absorb the sun's rays which creates food and energy for the plant. The photo at right is of 'Sweet Summer Love' Clematis, a perennial vine that tends to sleep, creep and then leap. It was pretty small when I planted it last summer and it literally sat there all summer, never growing taller than the four inches it was when I planted it. It was sleeping for sure! This photo was taken this spring, and you can see by the yellow arrow how tall it has gotten in the three weeks since it started growing. It's a good two feet tall now and is just getting started for the year. I don't know that I'd call this creeping, we might be leaping at this stage.. In their third year, perennials burst into full glory. The roots are now very well-established, they are growing strong and flower power is amazing. 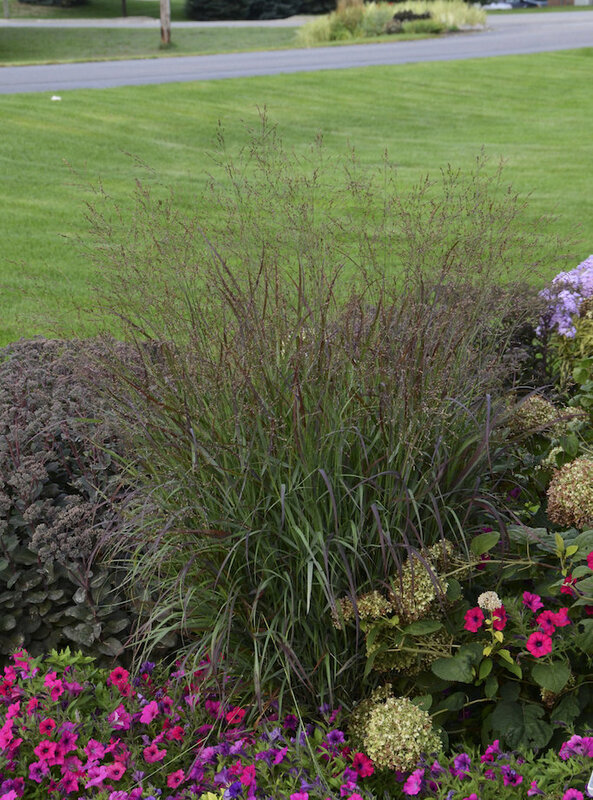 My Shadowland® Autumn Frost (left) is definitely in its full glory! It is almost as if it is bursting with joy! It'll leave you thinking "Now THIS is what I was talking about!" Some plants stay at peak performance for decades, peonies, for one, seem impervious to time. Others are at their peak for 3 to 5 years and then begin to decline, which is your signal to dig and divide them. That will give them more elbow room to grow and will make you the favorite among all of your gardening friends. After all, she who has divided perennials to share, shall be most popular. 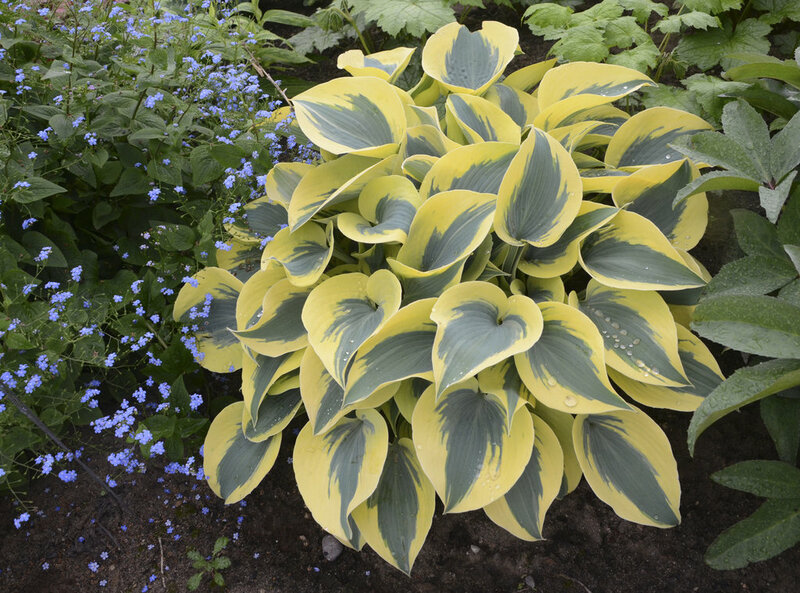 In your second photo of 'Autumn Frost' Hosta, what is the plant on the left with the small blue flowers? Thanks for the interesting article. 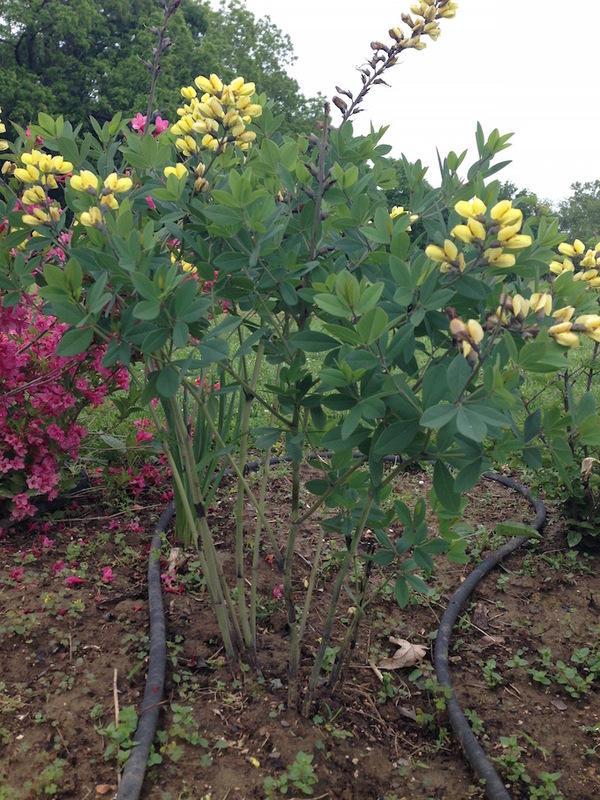 In my challenging conditions, even natives, like baptisia, take 5-7 years before they leap. That is a Brunnera macrophylla. Here is a link to more info on Brunnera http://www.waltersgardens.com/plants/view/?plant=1615. I have hedge high hydrangeas! (This is 3rd summer in this house!) not liking ugly woody stems all winter I pruned back 2/3's! That summer - No blooms! Last year, no pruning, this summer NO BLOOMS!!! Any suggestions? BTW two other hydrangeas, that I moved to this location, or purchased bloom nicely?? Some hydrangeas grow on the dead wood. They need to be fed, and they are an acid loving plant. Very hardy! It sounds like the hydrangeas that didn't bloom are big-leaf hydrangeas. When you pruned them, you inadvertently removed all of the flower buds. Now, i don't know where you are located, but in cold climates, winter cold or spring freezes can kill the flower buds, even if you don't prune them. Please take a look at our Hydrangeas Demystified sheet for a more in depth explanation: https://www.provenwinners.com/Hydrangeas-Demystified. Sleep, Creep, Leap is maybe the reason for plant resurrection. A school ground garden was planted with native shade plants (zone 4) some 15 years ago. 6 years ago the school building was mothballed and the garden had no attention. What could dominate (cup plant, wild cucumber, some sort of a 6' aster, dandelions, creeping charlie) did dominate soaring to 10 feet at the tallest and all connected with bindweed. Four years ago, some neighbors got together and simply ripped out everything we couldn't recognize. Recovery was limited to: don't pull it up until you can identify it, then look it up, then decide. Every year new plants have shown up, some of which didn't appear on the original planting charts, some of which have apparently moved as much as 20 feet down the lot. It's a real adventure. Turtle head can't find a place to settle. Monarda has shown up in surprising places, there's so much more going on. Hepatica, bloodroot, culver's root, Joe pyeweed, cranesbill, trilium, solomon's seal, prairie onion, prairie sage, columbine, virginia waterleaf, virginia bluebells, and so many more surprises have appeared. Keepers, all. Plus (to be realistic and not pollyannish) thistle, garlic mustard, and a few other really nasty guys. Do you know what sand burs will do to your sox? but: Sleep, creep, leap, indeed! What a great article. I knew this was true about some vines but did not know that the concept applied to perennials in general. I will have more patience with my gardenias planted last fall and while green and seemly happy no buds yet...hopefully next summer! Wondered if you could help with a hellebore placement issue I am having. I wanted to plant some Hellebores under a Japanese Maple in my garden. The JM is not very large yet, perhaps 4.5 ' across. I planted the Hellebores out about 10 " from the edge of the outer leaves knowing that the JM will continue to spread as it grows and not wanting the Hellebores to be covered by the canopy as the JM grows. unfortunately the Hellebores are getting full sun from about 11am to 3 pm and I am worried that they will burn or atleast no thrive while waiting for the JM to grow (years). Question is...do I leave them there and hope for the best or move them so they are under the canopy of the JM now knowing I will have to move them farther out from under as the JM grows? My first thought was transplant your Hellebores back into the shade and then move them as the JM grows. BUT then I thought what if they do fine where they are? Save yourself the work. SO I think the only way to really know which is right is to wait. IF the sun begins to burn your Hellebores and they seem to suffer, then definitely move them back into the shade, but if they seem only a little stressed but otherwise doing well, let it roll for another year and see if the JM doesn't make up the difference in light! Thank you! I never knew this and now I will be very patient with new perennials planted last year as well as a few planted this week. I thought I gad done something wrong, but plants are just settling in.